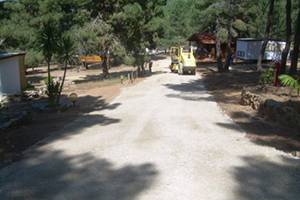 ECOP@V is the alternative to the traditional ecological paving. Born through the most innovative technologies, is now the ideal solution for building ecological trails and for different uses. 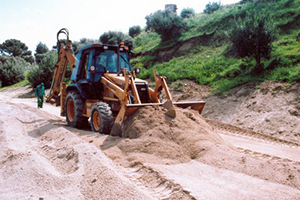 It consists in the treatment of the surface of intervention, with a particular adhesive composed of an acrylic polymer(SPH 1K) non-toxic, colorless and environmentally friendly in aqueous solution, sprayed with suitable means Work fitted with special pumps and hoses they are capable of working at high pressure on an application surface (soil, sand or gravel) previously leveled and rolled. 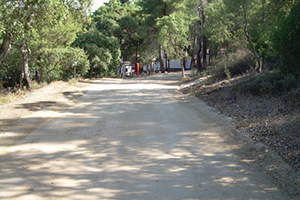 The versatility of ecop@v, makes it indicated for the use ininnumerable types of intervention, even in areas where access to conventional means of work are particularly difficult or in areas where the realization of ecological paths is the only system to create solutions for viability and usability of areas with minimal environmental impact. The dosage percentage of the acrylic polymer adhesive in aqueous solution, allows interventions ranging from simple dust treatment areas of dirt in general, to the creation of natural paths, pedestrian or cycle up to the realization of roads for motor vehicles intended for heavy traffic.